2. The capacity of the campaign venue is a maximum of 40,000. If out of the millions of registered voters in Kano, a meagre 40,000 came to grace the rally, it shouldn’t mean anything to those who use reason. 3. Assuming #5000 was given to each person at the campaign venue (as alleged in some quarters and confirmed by some people in the Kwankwasiyyah group), a piffling sum of #200,000,000 would have been more than enough to gather such crowd. 4. What he spent on just a hundred and fifty delegates can garner much more people than we saw yesterday. As we all know, the PDP is a party filled with people who are media freaks and would do anything to have a good image on social media rather than in reality. 5. 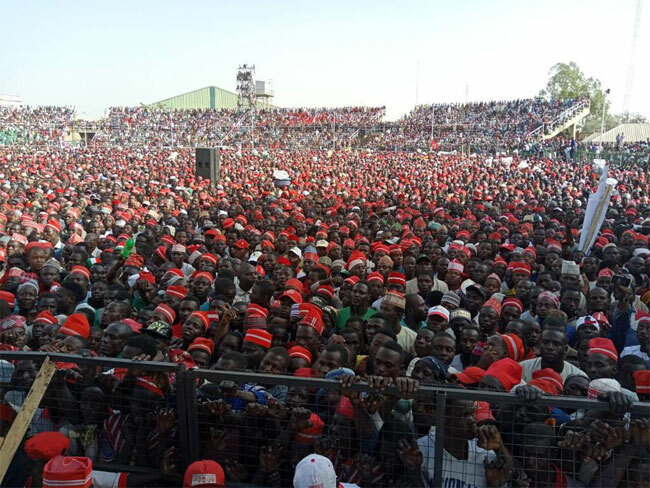 What should be worrisome to the PDP(if they are thoughtful) is the fact that over 90% of the crowd were on red caps, which means if you don’t belong to the kwankwasiyyah movement, there is high likelihood that you don’t do Atiku..
6. A friend of mine who happens to belong to this movement told me clearly yesterday that, even if they were not paid, majority of them would have gone to welcome Atiku and cronies just because they wouldn’t want Kwankwaso to be disgraced...but this doesn’t change the fact that those who will be voting for Buhari in the presidential election are in the majority. 7. Kano State is so populated that even if the devil goes there for campaign, he would get at least 30,000 people to welcome him.